All political pusillanimity consists of concealing and veiling that which is. Due to the economic and socio-political success of the post-war decades, a certain sense of pride has emerged in Germany. This pride is based on the diligence and efficiency of German citizens, in the steadily increasing standard of living, and the ever more developed welfare state. The four great economic crises — 1966/7, 1974/5, 1981/2 and 2008/9 — have hardly harmed this pride and Germans’ trust in the soundness of their economic and social model. Even the effects of globalization, the shifting balances of power, the environmental pollution and the feared effects of climate change have so far not had a lasting effect. This basic optimism has, after decades of almost undiluted success, clouded Germans’ view of the process of social decay and its hazards. “Germany abolishes itself” might seem an absurd fear. Here is a country with a population of 80 million in the heart of Europe: with all its cities, industry, cars, trade and commerce, hustle and bustle … But a country is what its inhabitants make of it through their living traditions, both spiritual and cultural. Without its people, Germany would be merely a geographic expression. The Germans however are gradually abolishing themselves. A net reproduction rate of 0.7 or less, as we have had for the last 40 years, means that every generation will be half as big as that of its grandparents. The annual birth-rate in Germany fell between the early 1960s and 2009 from 1.3 million to 650,000. If this continues — and why should it change, when this trend has already persisted for four decades? — then after three more generations, in ~ 90 years, the number of births in Germany will be between 200,000 and 250,000 a year. At most, half of these will be descendants of the pre-1965 population. The Germans have, in a sense, already abolished themselves. Many are glad to imagine this as a righteous punishment for the people whose sons once filled the ranks of the SS. Perhaps this perception explains why, when discussing the decline of the German population, some speak with barely concealed joy. Other, less self-loathing, people console themselves by looking at small peoples who manage to survive as a group, for example Denmark, with its 5 million inhabitants. Germany could become a somewhat bigger version of Denmark. What would be so bad about that? Could that not work for Germany? Perhaps it would, if Germany did not face qualitative demographic shifts, a declining birthrate and population pressure brought on by poor immigrants. For decades it was impossible to discuss the consequences of the declining birth-rate. Anyone who tried was automatically suspected of being a racialist. That has changed recently, now that post-war generation (The “Sixty-Eighters”) has become worried about its pensions. But it is 40 years too late. that the individual is responsible for his behavior and not society at large. If a student cannot pass a test, it is because of his parents’ educational underachievement. If poor children suffer from obesity due to lack of exercise, it is not because of parental neglect, but the family’s social disadvantage. If children of single mothers cause problems in school, society is to blame because it did not provide enough support. This should raise the question of what social conditions and individual dispositions lead to the prevalence of single parents, and what can be done about it. If third-generation Turkish immigrants do not speak German, it must be because of the environment of antipathy toward their acceptance. But why, one might ask, do we not observe this problem among almost any other immigrant groups? It is a sociological fact, albeit a banal one, that everything depends on everything else. Recognizing this fact has led to a tendency of ascribing everything to sociological relations, relieving the individual of any moral responsibility (and, to a large extent, actual responsibility). Like an infection, political correctness has spread throughout our ailing body politic. On questions of social organization and control, it hinders both diagnosis and treatment. When I was a Berlin Finance Senator, I released a report that concluded that the state’s minimum subsidy was sufficient for maintaining a healthy and varied diet. A firestorm of outrage followed. The report suggested that being overweight is not due to an individual’s station in life. Rather, it is due to poor nutrition, and is thus the result of an individual’s behavior, for which he is responsible. But that was not what anyone wanted to hear. Many of those aggrieved wrote letters to the editor to express their outrage, which I could understand. What I could not understand was why the so-called Good People pounced on me when I made a casual remark about wearing a sweater to save energy. In managing political, economic and social development, we should take into account what people want to achieve. But we must also take stock of the actual causal relationships. Granted, everyone has to work in a normative context, whether one only reflects on social issues or wants to solve them. Both thinkers and doers need normative models to analyze reality. But the model will distort reality if it ignores or misunderstands human nature or sociological and psychological causation. Social engineers who proceed in this manner do more harm than good. Unfortunately such social engineers exist, and many of them harm our society and diminish our prospects for the future. For too long, they have overlooked our demographic problems. Our population is not only aging and shrinking, but its composition has undergone qualitative changes. Besides the sheer decline in numbers, our population has suffered a rise in less stable, less intelligent and less capable people, who endanger the future of Germany. Proving that this is the case, explaining why it is, and figuring out what to do about it — that is what this book is about. My statements rely on empirical research, but I have tried to keep my presentation direct and to the point. I am concerned primarily with clarity and accuracy, thus the argumentation is direct, without indecision or flourish. I have refrained from using flowery language to tiptoe around difficult issues, and while I tried to present a realistic picture — the results are shocking enough without any embellishment. Qualitatively because educational potential and standards seem to be deteriorating with every passing generation, and an ever shrinking number of people have a productive, innovative mentality. As a professional economist, top official and politician, I have had plenty of opportunity to subject each one of my theories to the most rigorous scrutiny, to all conceivable counterarguments. With these counterarguments I have filled thousands of pages with outlines, memoranda, speaking notes and essays over my 35-year career. My bosses had to survive politically, and I had to give them the means to do so. This prevarication had a price. Oftentimes truths, subjectively felt, could only be presented in small doses. In positions of political responsibility it is not impossible to express unpleasant truths, but again and again I have found it very difficult. Indeed there is a certain wisdom in the politician who focuses on solvable problems and proposals that will appeal to the majority. But doing so can hinder both diagnosis and treatment of the underlying issues, and if the politician is not careful, his brain will be clouded by loss of judgment. But unfortunately, that is how it goes with all top politicians; they find refuge in superficial thinking. As a result, there is a huge demand for unvarnished Truth. But whoever satisfies this demand exposes himself to the media’s power and its exercise of political correctness. My 39-year career, has given me broad experience in crafting financial-policy. I spent seven years as an active politician in the Berlin state-government, six years as a state secretary in Rhineland-Palatinate and 16 years in various functions and at different levels of the old West-German government bureaucracy in Bonn. Towards the end of my career, I had acquired a reputation for formulating successful fiscal policy. Only then did I dare to make a couple offensive remarks, and these concerned matters outside the narrow purview of high finance — about how to reform the welfare system and how to save energy. Despite all my practical experience, I was dumbfounded at the reaction my remarks unleashed. It was as if no one had ever heard a public figure use common sense to make a point. What really scared me was the flood of hate-filled mail I received as soon as I showed concretely the possibility — and necessity — of personal responsibility and self-reliance. My remarks about eating healthy and wearing a sweater were especially unpopular. However, it seems there is an ever increasing group of people who want to take responsibility for themselves and their lives. This development is in no way limited to people of a certain income-level or social stratum, and it is in no way new. In hindsight, the trend is discernible through the second half of the last century. The German Federal Republic of the last 50 years was a very modern polity. After the two lost wars, Germany suffered catastrophic consequences: The state’s institutions were destroyed, traditions called into question, and the population was thrown into turmoil through flight and expulsion, especially from the formerly German lands in Eastern Europe. Amazingly, Germany came through it all with little damage to its specific strengths — its high standard of research, education and technical training, a high-performance economy and a competent bureaucracy. And despite the fact that around 90% of the ruling class and the bureaucracy were willing accomplices of the Nazi dictatorship, their efficacy in leading the country’s reconstruction was in no way affected. The traditional German industriousness made it through the wars unchanged. And even the opportunity to rebuild kindled the German penchant for innovation and improvement. The refugees and displaced persons distinguished themselves in particular. They found themselves in the same position as immigrants to the United States in the 19th century — destitute and in a foreign land. Only through hard work could they make headway. And they were very industrious, so much so that their example compelled the long-established inhabitants to get busy. the rapid liberation of the West German economy from the numerous administrative restrictions between 1948 and 1951, the great and lasting legacy of Ludwig Erhard (post-war Minister of Economics, later Chancellor). Ultimately, the great promise of a “Social market economy” united the whole nation behind the re-construction effort. A fair share of the general prosperity would be available to all, and everyone would be protected from hunger, cold and grinding poverty. Whoever wanted to work would be able to. This promise would be fulfilled, and marvelously so! From 1950 to 1960 the West German economy grew at a yearly rate of 8%. Unemployment fell from 11 % to 1.3% between 1950 and 1960. The real income per capita of the population grew in 10 years by almost 70%. In 1955 West Germany generated a per capita GDP as high as France’s. In per capita GNP it had surpassed the victorious Great Britain as early as 1952. In 1966/67 for the first time since the war, doubts emerged about whether the economic growth and full employment had been more or less permanently assured. These were quickly put to rest thanks to the glorious growth rates from 1968 to 1971. In 1968 a segment of the post-war generation began to protest the social model, whose essential basis and main objective seemed to be nothing more than raising manufacturing output. In 1972 The Club of Rome pointed out the finite nature of the World’s resources when it released its first report, entitled “The Limits of Growth.” This was the impetus for the environmental movement. A direct path leads from this report to the present-day discussion of the effects of uncontrolled global warming (“die Klimakatastrophe”). In 1973 the first oil crisis set off a recession, Germany’s second largest since the war. The full employment of the 1960s has never been reached since. In 1979, the second oil crisis followed the Iranian Revolution. The crisis led to the third post-war recession and to the overthrow of Helmut Schmidt’s social-liberal (SPD-FDP) coalition. In the 1980s the world-economy was successfully stabilized. After a world-wide shake up of monetary policy, inflation was brought to a tolerable and sustainable level. The German economy grew further, if substantially slower than in the 60s and 70s. Unemployment fell, but generally remained higher than before. From 1989 to 1991 the world map was changed radically by the breakup of the Eastern Bloc and the dissolution of the Soviet Union. The distribution of world economic power underwent a major transformation with the acceptance of the market-economy in the former Eastern Bloc, and above all in China and Southeast Asia. This transformation is still in progress. Like no previous development, the spread of capitalism has raised doubts about whether the promise of the “social market economy” can be kept. Indeed, its very survival is in question. Ultimately, globalization means that equal work gets equal pay in free-market countries, because they are able to allot the necessary public resources to education and infrastructure. To put that in economic terms: labor’s marginal cost and its marginal product tend to align everywhere there is a free economy. Just as marginal capital compensation acts as a world-wide interest rate, labor-compensation also tends to level out. It makes complete sense that in Germany the real wages of young people today are no higher than in 1990. The same situation prevails in, for example, the US and Italy. Real wages will not start to climb again until wages in countries like China, India and Thailand have reached Western levels. This development — another theme of this book — comes at a time when German economic power is waning due to factors totally unrelated to globalization. The quality, the structure and the cultural background of immigrants in Germany. For me it is an open question, whether and to what extent it is even possible to impose reforms that run counter to the structural changes of our economy, our society and their ever changing conditions. Nothing stays the same forever, and no social condition is able to be preserved indefinitely. On the other hand, it is impossible to make judgments, to evaluate conditions and to formulate necessary changes without a normative picture of society. But why, one might ask, should we bother thinking about the future and its implications at all? Should not each generation concern itself with its own problems and let later generations deal with theirs? In all these questions, we are virtually surrounded by paradoxes that are basically unsolvable: We assume that only individuals have a personality and an identity. On the other hand, there is no intrinsic value in all forms of social organization — communities, societies and peoples — according to the prevailing view. Moreover, groups only matter insofar as they consist of individuals, for the prevailing view rejects the idea of a divine world-order and similar philosophies of history. It is paradoxical then, that we think so much about the future of the environment. We accept as inevitable that Germany will become smaller and dumber. We do not want to reflect on it, let alone talk about it. But we do think about the world climate in 100 or 500 years. 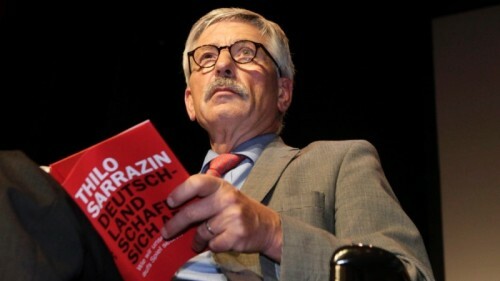 It is totally illogical to overlook the condition of the German polity, because if the current demographic trend continues, in 100 years Germany will have 25 million inhabitants, in 200 years 8 million and in 300 years 3 million. Why should we interest ourselves with the world-climate of 2500 AD, if the German social program amounts to the abolition of the Germans. In a world without God, the condition of nature has no value of its own. It is no more than the living environment of mankind. Therefore only the individual’s well-being provides any justification for the upkeep of nature. This justification is eliminated along with the individuals themselves. But in fact, contrary to all logic, most of us ascribe an intrinsic value to social organizations just as we do to the individual: Many employees love their company, in which they have worked for decades, others love their soccer team, and still others love their city, its land, its people. When we attribute value to the entities that transcend us, it motivates us, lifts us, makes us proud, gives us driving force and lets us forget our own petty pains and our great sorrows. Only when it comes to Germany, do many censor their own thoughts (lit. have a scissors in their head). Do you love your home? Yes! Are you a local patriot? Naturally! A citizen of the world? Clearly, it’s only fitting. A German? Only for the national soccer team. Otherwise it’s rather embarrassing. To worry about Germany as the land of the Germans is considered politically incorrect. That self-censorship explains the existence of so many taboos and the completely garbled discussion of topics like demography, family policy and immigration. I believe that we will not solve our social problems without a healthy dose of national self-assertion. In 100 years, there will still be a Europe that is economically united and capable of acting in concert in its foreign affairs. But it will still comprise national states that are decidedly Polish, Danish, French, Dutch or British. Only on the level of the nation is there democratic legitimacy, and only there can one find the power for social renewal — or maybe not. The hope that the national states will dissolve into a united Europe is a late product of German escapism. Quite an ambivalent hope, because it ultimately projects the memory of a European-wide empire — not totally devoid of historical overtones: The borders of the EU’s founding members (West Germany, France, Italy, Belgium, Holland, Luxemburg) corresponded almost exactly to the Frankish Empire under Charlemagne. But lamenting the course of history is a dead end. As soon as anyone tries to reverse trends that seem unfavorable, he is in danger of thinking ahistorically, falling into nostalgia, and misjudging the influence that should be afforded key moments. Like a river, the stream of history is constant and never returns to its old course. Still, nostalgia is tempting for all those who want to preserve the good and do not condone change for its own sake. The realist accepts that every historical position is a two-sided coin: The traditional idyll of country life is incompatible with modern agriculture. The sureness of tradition and a clear set of values is incompatible with the tempo of technological change. The well-being of our regional and national peculiarities are incompatible with the many follow-on effects of mass-immigration. You cannot have your cake and eat it too. But if realism is totally devoid of both nostalgia and a forward-looking creative drive, it is scarcely distinguishable from fatalism and indifference. It is flat and banal. Of course, it is easy to project one’s own problems onto the world. As the shadows grow longer in our lives, we tend to take a darker view of the world. But I do not think that age has distorted my view of the aforementioned social problems, because I have been intensively occupied with these questions continuously for the last 30 years. Anyone who finds the existing historical trends lamentable should make sure his position is grounded in a solid philosophy of history. Does he lament the changing times simply because he feels alienated, being dependent on the values and conditions of the past? Yet it is by no means true that nostalgia is the only explanation for why someone might feel discomfort about the direction and potential consequences of social change. A social order depends on a specific set of conditions. No matter how long it lasts, any social order arises from a particular amalgam of factors, be they environmental, geographic, technological, cultural, political or demographic. If this set of conditions changes, the society must also change. The end of the Middle Ages, for example, accelerated the pace of change in technological development and increased the amount of interaction within societies and among them. The conditions of social existence change incessantly, rarely remaining as they are. The changes are not always for the best, as the horrific errors of the twentieth century show. But there are also elements of stability, which defy change for long periods. Such are the regional and national identities of peoples. When ten Sicilians and ten Friesians do something, the results are just not the same. Further examples of enduring elements stem from the influence of religion, tradition, the bonds of family and the respect for elders. These elements form the glue that stabilizes society against the tendency toward alienation not only of the individual, but also of greater social groups — of entire societies and entire peoples. So when these elements break down, a critical situation arises, making conditions that are ideal for political turmoil and armed conflict. The alienation is more pronounced in times of stark change or catastrophic upheaval, which includes war, natural disaster and epidemics like the Black Death. Besides times of stark change, there are again and again ages of stability. People can live in peace and security for several generations in a well-ordered and seemingly unchanging world. Only disease and death threaten their lives. Whoever lived in such circumstances considered himself safe, for he belonged to a natural order. It was the best possible world, a high point, from which society could only go downhill. Those were the golden ages, which history relates again and again. There were many of them, lasting two, or sometimes as many as ten generations — epochs in which history, at least in one area, seemed to stand still. For man had created something perfect. Variation and persistence determine how and to what extent society will change. External influences also play a role, but they do not determine a society’s trajectory forever. An extreme example is the totally different paths taken by English and Russian society. Both were founded by Viking tribes (the Varangians in Russia, the Normans in England), and still each society went its own way. The renowned “golden ages” have always distinguished themselves by displaying the right mix of stability and elasticity. Without stability, continuity is impossible. Without elasticity, survival is impossible. But nothing remains exactly as it is. Under the most beautiful tree, the worm already gnaws on the roots. As the late Willy Brandt put it well, “Nothing comes from nothing, and only little will endure.” In the long run, all human activity is in vain. Even so, we are not entirely helpless before historical destiny. Like most of life, the contents of this book are ambivalent: The trends described herein gnaw at the roots of material wellbeing and social stability. But there is always a starting point, from which you can change much for the better. You just have to do it! “Sozialstaat,” which emphasizes protecting its citizens from undeserved hardship. German also has the broader concept of “Wohlfahrsstaat,” which denotes a government that promotes the wellbeing of its citizens. While “Wohlfahrsstat” literally means “welfare-state,” the usage of English “welfare state” seems to correspond better to “Sozialstaat.” “Wohlfahrsstaat” has no English equivalent in common use. Perhaps we could say “nanny state,” but without the negative connotation. Marginal cost is the total cost from producing one more unit of output. Marginal product is the growth in output resulting from one more unit of input. https://www.theoccidentalobserver.net/wp-content/uploads/2018/06/TOO-Full-Logo-660x156-1.png 0 0 Thilo Sarrazin https://www.theoccidentalobserver.net/wp-content/uploads/2018/06/TOO-Full-Logo-660x156-1.png Thilo Sarrazin2016-01-08 22:15:422016-01-10 09:12:33Introduction to "Germany Abolishes Itself: How We Are Gambling with Our Country"